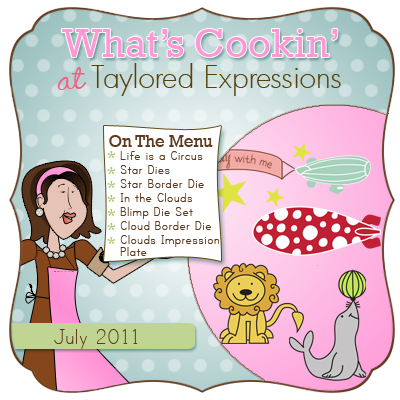 Taylored Expressions: Sneak Peeks Day 2 ! 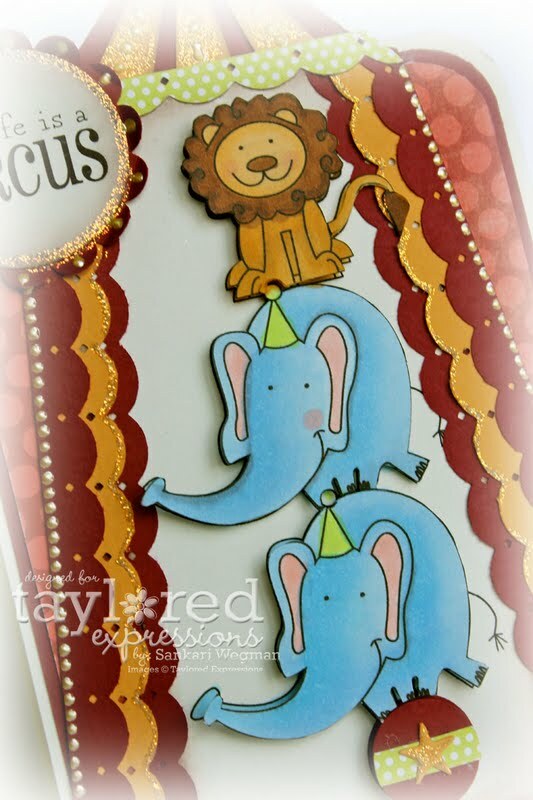 It's Day 2 of sneak peeks over at Taylored Expressions where the release week party keeps rocking with some awesome stamp sets and dies that are being peeked today! 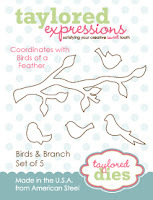 One of the stamp sets that we are peeking today is the super cute full sized stamp set that has 21 images/sentiments entitled: Birds of a Feather. This is such a super cute stamp set illustrated by the uber talented Nancy McKinney and is full of the cutest birdcages, birdies and wonderful branch - and coordinates with the Birds & Branch Taylored Die, which makes it a cinch to cut out the stamped branch (or even cut out the branch from a DP). 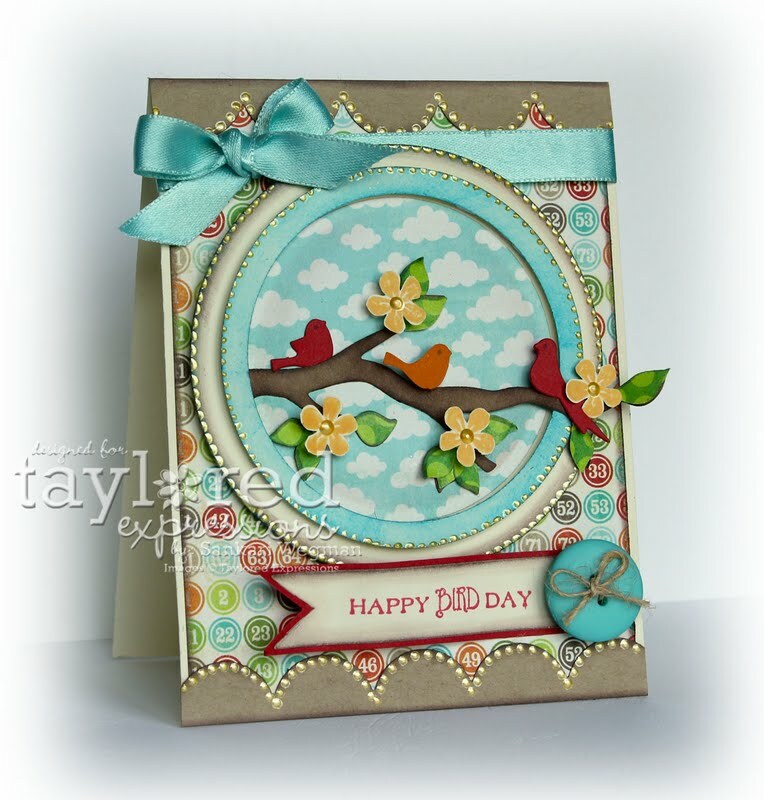 I love this sentiment: "Happy Bird Day!" 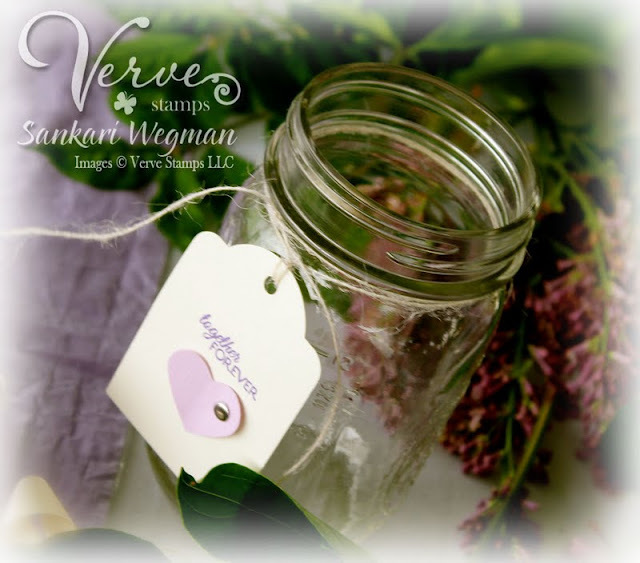 Accessories: liquid pearls, EK success scallop punch, 3/8" satin Caribbean ribbon, Circle Spellbinders, dimensionals, button from BG and dimensionals. 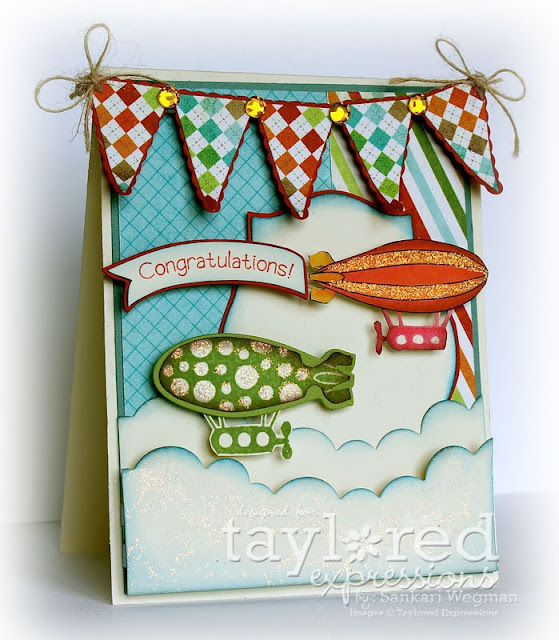 I used the Seeing Stars Taylored Dies that we peeked yesterday (which also coordinates with the Life is a Circus stamp set that was peeked). I so love this die - its so much fun! And I adore the fonts of the this stamp set - so much fun! I double stamped the sentiment in both red and black ink and then grunged the edges a wee bit. I loved coloring in Moka Justin and it was so much fun paper piecing his sweatshirt with the DP from the Rocket Age paper packet from October Afternoon. Accessories: dimensionals, copics, Seeing Stars Taylored Dies, corner chomper and spellbinders. I had so much fun creating these cards and hope this Biebs inspired card is cool enough for my friend's "about to become" teen! I know I can't wait to make more :) Please check out the rocking rocking samples that these awesome ladies have created with these gorgeous stamp sets! Please stop by tomorrow for some release Day Fun!! 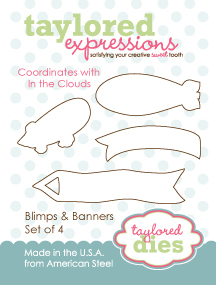 PS - here are all the new dies that are being released this Friday that I used on my project today! 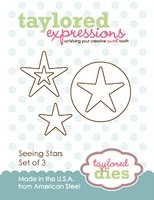 This week begins the start of sneak peeks over at Taylored Expressions and each day there will be some super fun cute peeks from the July Taylored Expression stamps that will be released this Friday at 8am PST! 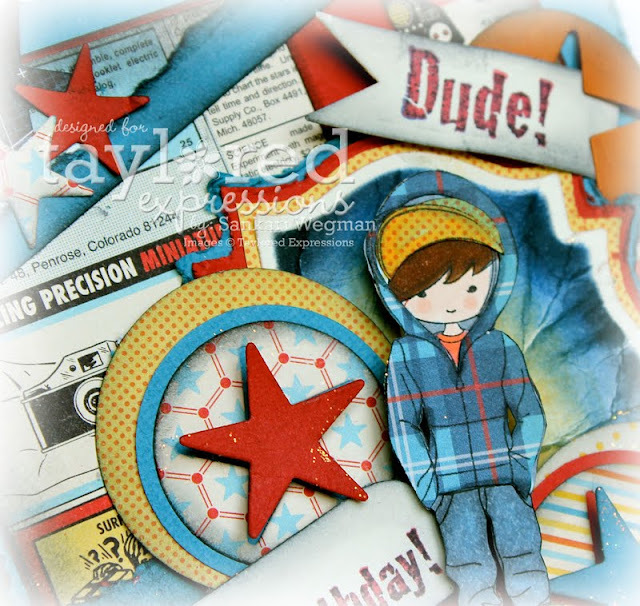 Today's peeks are so super cute - I simply adore both of these fun and awesome stamps - and the perfectly coordinated dies! The second super cute stamp set that we are sneak peeking today is the full sized stamp set Life is a Circus stamp set (17 images) which was illustrated by Doug Applegate for the Apple Doodle Ink Line. Can I just say a HUGE OMGoodness "how cute!" - I adore the super cute images in this stamp set and I absolutely ADORE all the cute animals and sentiments and images! 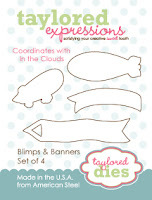 The sentiments are so awesome for both adults and children - soooo super cute! 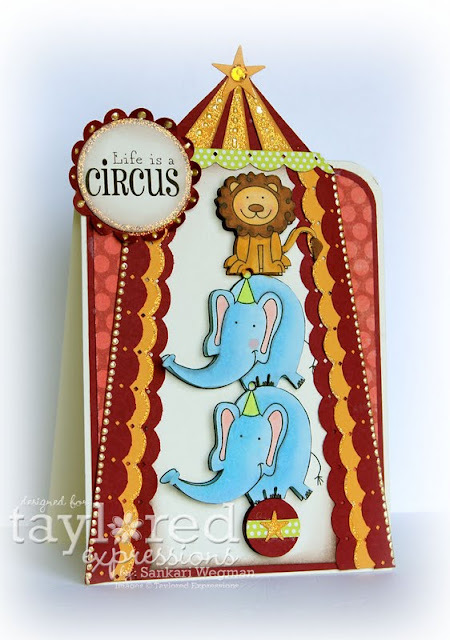 I had so much making this card - I just adore adore the elephants and cute lion and so I thought it would be fun to pile them up and create a little tent-ish card :) Just seeing the elephant balancing his buddies on one little ball SO makes me smile :) and I adore the Seeing Stars Taylored Dies (set of 3) that coordinates perfectly with this set and is perfect for so many other stamp sets! I used it to create the little ball for the cute Ellie and the top of the tent - the flaps of which I created with the EK success scallop border die and lined with some liquid pearls. Here is a closer peek at this stamp set - I adored coloring these cute images with my copics and some how started grinning from ear to ear by the time I was done - I just adore these guys! Accessories: liquid pearls, Seeing Stars Taylored Dies, EK success scallop border punch, Diamond stickles, dimensionals and corner punch. 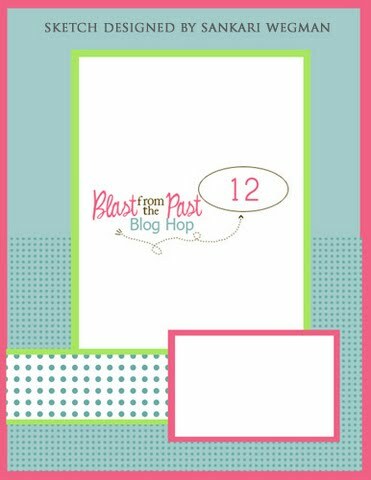 I had so much fun creating these cards and can't wait to see all the fun creations that these awesome ladies have come up with these super cute stamp sets - Please hop along with me get ready for some major cuteness!!! Please stop by tomorrow for Day 2 of sneak peeks! 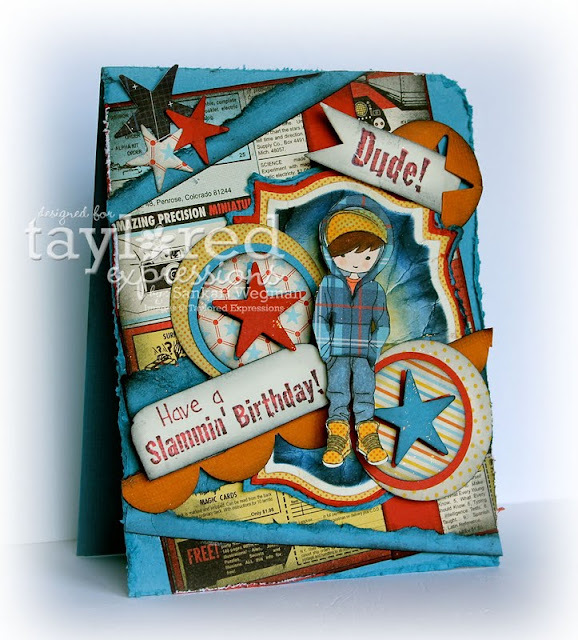 Today over at Taylored Expressions, is the totally fun monthly June Blast from the Past Blog Hop which is open to all customers and fans of TE to join in by creating a card using a previously released TE stamp set. This month's theme is "Old Glory" and to use the colors red, white and blue in your creation (it doesn't have to be patriotic images) and you can create with the optional sketch provided. 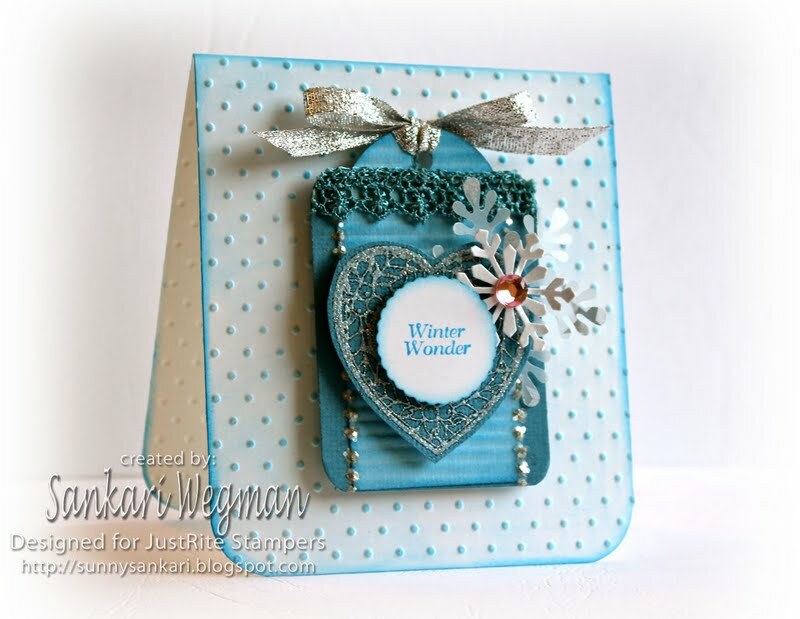 I kinda went with a more turquoise version of the blue and created a card for a very dear friend of mine who is starting a new chapter in her life. She has gone through so much this last year and even more these past few months - and as she ends one chapter in her life and starts a new life (something that is both scary and exciting) I wanted to make her a special card to honor her courage and to let her know that she is not alone. The best part about making this is being able to give it to her in person - I am so excited to be able to hang out with her next week and spend some R&R time together :) I had fun making this card - and I hope you have fun hopping along today and checking out all the Blast from the Past creations from everyone! I can't wait to hop over and check out all the creations that everyone has created with these colors! 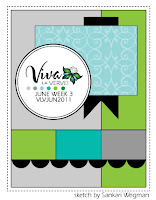 VLV June Week 3: Sugar and Spice! 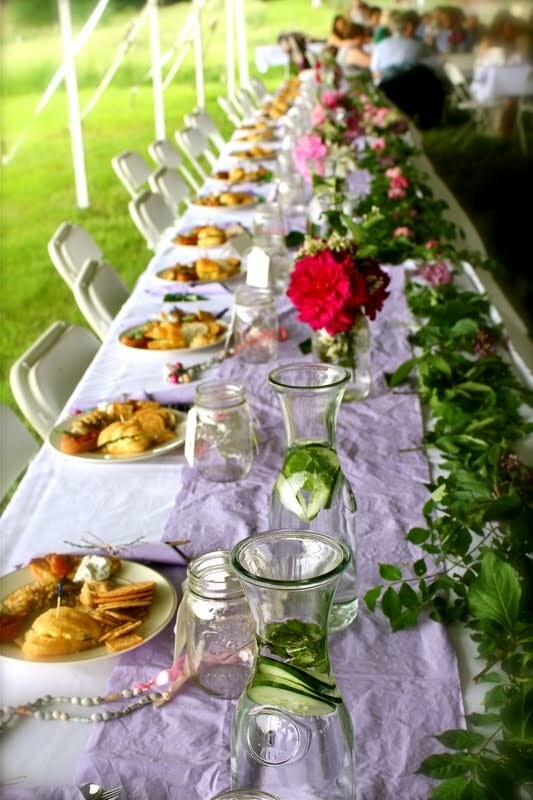 This week began with scurrying to get packed to go to a wedding this weekend (I am telling you, I have been to more weddings in the last 3 weeks than all of last year!) - but first I wanted to play along with the Viva La Verve challenge for this week, which I am also hosting :) I hope you like the sketch (no skewed panels! 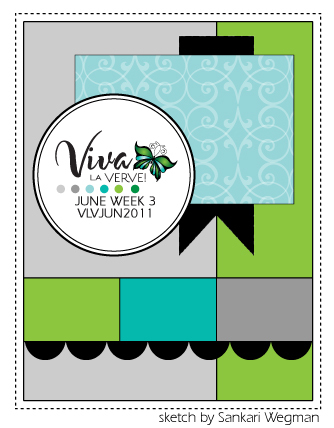 ;) and will play along with us - please check out more about the details of how you can win some yummy Verve by playing along with all the Verve sketches this month - over at the VLV thread week 3 over at Splitcoaststampers! Here is this week's sketch and I used it to make a special birthday card for one of my dear friend's one year old baby! I used one of my favorite stamp sets: "To The Moon" from Verve stamps that has THE cutest little animals with the sweetest sentiments. 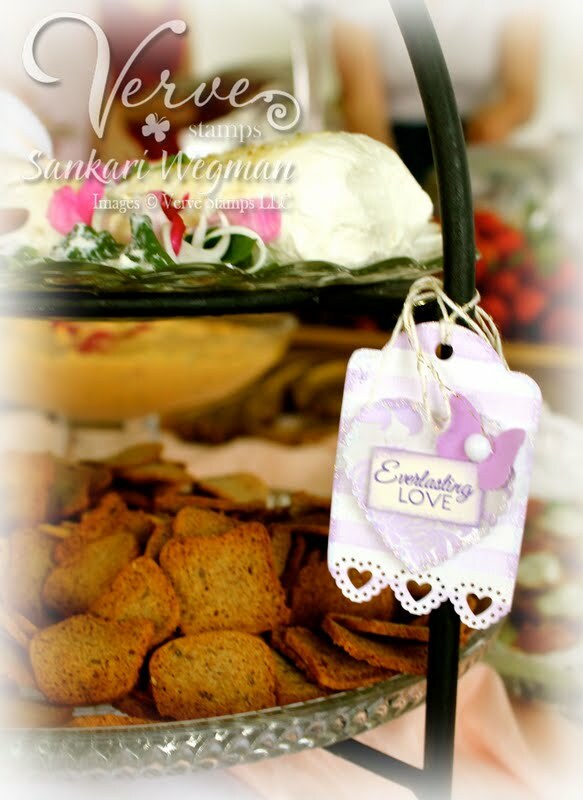 I loved going all girly with the sentiment: "sugar and spice and everything nice" with the sweet little bear holding a hear at the bottom as one of the panels. 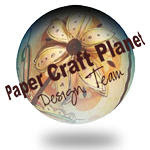 Accessories: MS edger punch, liquid pearls, bling from Want 2 Scrap, ribbon from MME, rosette (Timholtz) button from PTI with the PTI twine, bling, chunky glitter from MS, Spellbinders, sponger and dimensionals. I love how this came out - and can't wait to see what you come up! I love the three panels at the bottom because they can be either different pieces of paper, or sentiments or these cute little animals! 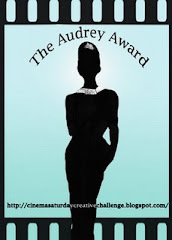 :) Please check out all the happenings over at the VLV thread and join in on the fun! Off to a fun wedding packed weekend! Today over at the JustRite blog we are showing peeks from the stamp set: Charming Christmas - which is a set of 7 stamps that coordinate with Charm Dies that was released exclusively by JustRite Stamps. Love when things coordinate! For my project today - I wanted to keep it simple and clean - or at least try to :) One thing that I always need during the holidays is a set of simple cards - either to be given as a gift in and of itself - or to give to teachers, neighbors etc. So I decided to make a quick set of 5 cards with the heart stamp as the center - and I made them assembly style. I first punched out the tags and crimped the lighter shade o blue and attached them together (5 times). I then stamped the heart in clear EP and then added some Stardust EP and embossed it over the blue cardstock and then die cut it out (cutting out the part for the hole). I then added some lace, two sizes of snowflakes (one in vellum and the other in a metallic shade of silver) and put a bling in the center of the snowflakes. I finished it of with some silver ribbon and liquid pearls and then mounted each tag with dimensionals and added it to the card base with approximately measures 3.75 x 4.5 or so. Each card base was sponged and then swiss dotted with rounded corners with the corner chomper. I might have gone a bit happy with the dimensionals :) I think it is a very layered card even though I was trying to keep it simple :) Here is a closer view of one of the cards. Accessories: liquid pearls, chunky glitter, circle punch, snowflake punches from Martha, corner chomper, vintage lace ribbon and silver ribbon from scratch. It's a special day for a very special someone! Our very own dear Taylor of Taylored Expressions is celebrating her birthday today - and we joined in on a mini celebration for dear Taylor with a little birthday fun blog hop! Jami asked us to join in to wish Taylor a fun birthday - and we all jumped in - so there are so many amazing wellwishers who are waiting to share their card and gift with Taylor today - if you came here from the incredibly talented and sweet Stephanie Kraft's page then you are in the right direction! Next on the stop after me is the awesome Rachel Sztonyk You can always start at the beginning by going to Jami's page. Jami asked us to send Taylor a fantasy birthday present if money was not an issue - and it was so much fun to think o what that might be - and I so dearest Taylor - if money were not an issue - I would love to give you your dream room for the baby. 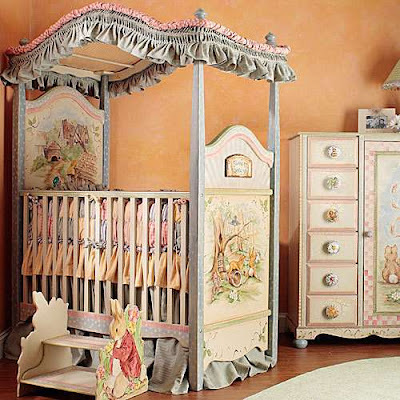 I found these wonderful sites that had the cutest bedding and cribs! But as I started looking at pictures - I just saw so many amazing rooms and so many amazing ideas that it was hard to pick. This nursery had me at cupcakes -Taylor - check out all that cupcake goodness!!! 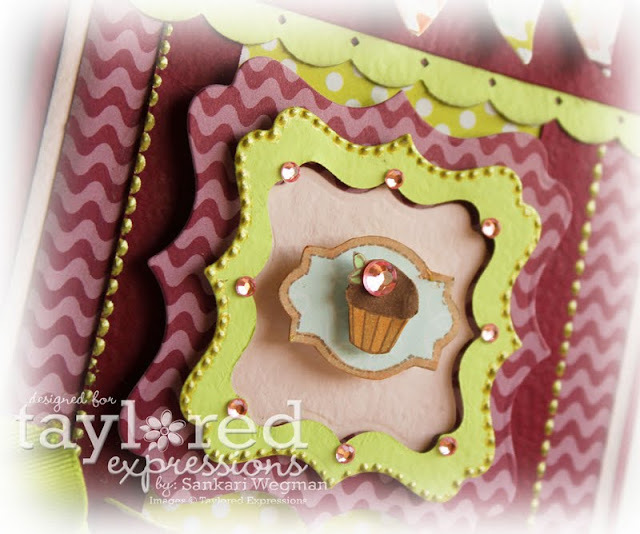 And this last one is so adorable - I love the scalloped edged wall (HOW cute is that - its like a card!) and the pennants hanging down - soooo very sweet!!! I simply adore you Taylor and have always been a huge fan since tbe very first time that I chanced upon your blog! 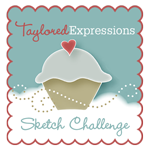 Taylor's sketch challenges were always so much fun and then when she introduced a new line of stamps - I think I about swooned and fainted! I feel so very lucky to be part of the Design Team and to create along with so many amazing artists! Thank you so much Taylor for the opportunity! You are just da best! I was so excited when I had a chance to first meet Taylor - and was so amazed at how short I felt :) Taylor and her husband and family are probably the warmest, sweetest kindest of souls and there is always laughter and fun around them - and that is what I wish for you dearest Taylor - a wish that everyday is filled with laughter and fun - and so much joy!!! For my card for Taylor - I wanted to create something that had a cupcake and something that had lots of layers and had fun colors :) I used the May Key Ingredients for creating this Happy Birthday card that I made using the cupcake from the It's in the Bag stamp set and the sentiment and tag from the Labels of Love stamp set. And the fun doesn't stop here - there is an amazing long list of wonderful ladies who are celebrating and honoring dearest Taylor - so NEXT on the hop is the amazing and wonderful Rachel Sztonyk who always delights with her gorgeous creations!!! 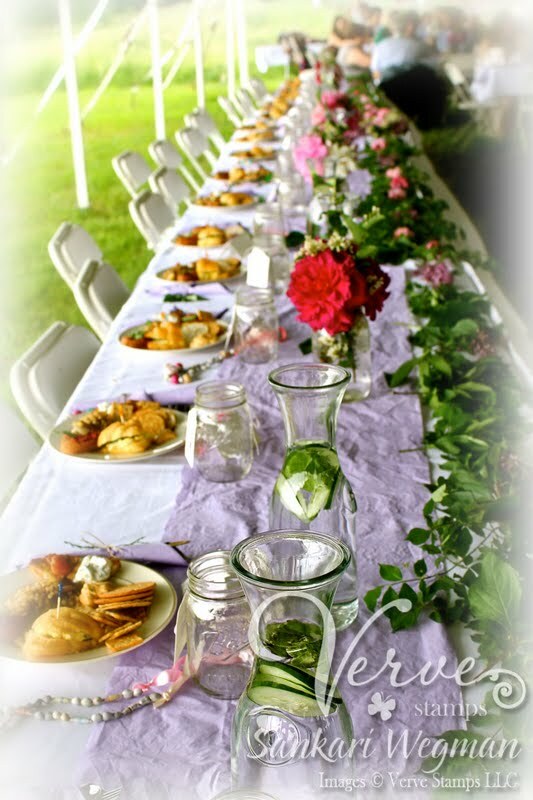 If you happen to get lost in the hop - or want to start from the beginning - please check out Jami Sibley's page for all the birthday hop information!!! I can't wait to give you the biggest hug next time I see you! Both the kids and that DH of mine - send you the biggest happy birthday shout out we can!! Hope you have a most wonderful birthday year and more to come!! A few weeks ago a dear family friend of ours asked if I could help her create some signs and tags for her wedding - and I of course couldn't wait to create something that she like :) Her colors were lavender and cream and I created some samples for her to pick one from - she was so sweet - she like them all - and so we created different tags for different purposes. I used one of my most favorite stamp sets: "Love Story" from Verve stamps to create all these tags - this is such a versatile set - with sentiments both large and small - perfect for all kinds of sized projects! I just loved creating these tags - and the best part was that my dearest friend and bride was happy! That makes everything worthwhile!! 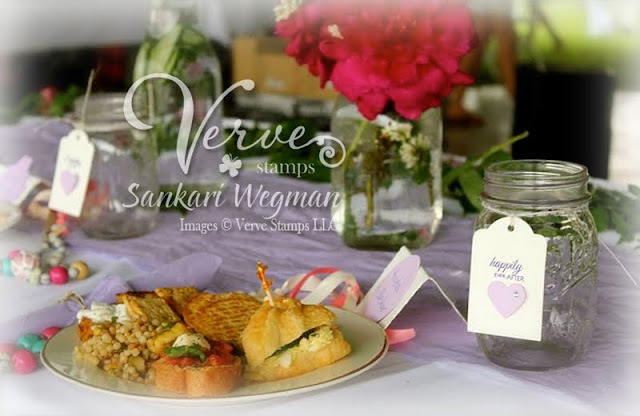 Please check out this awesome stamp set - Love Story from Verve Stamps - with wedding season approaching this summer - this is a total awesome one to have for all kinds of projects! 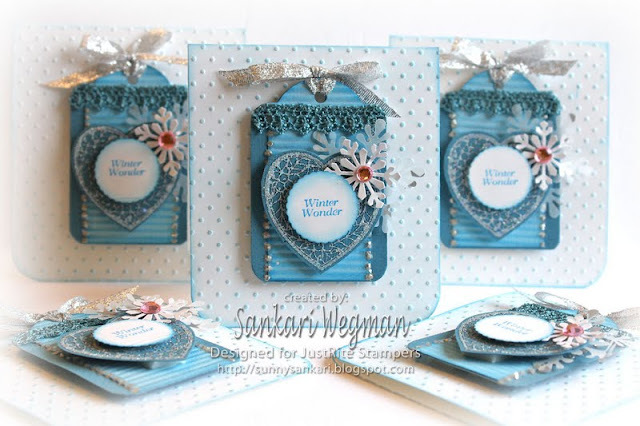 Today over at the JustRite blog, we are hopping around showing peeks from the awesome stamp set: Merry and Bright that is filled with Christmas stamps and sentiments and beautiful ornaments. I stamped the large ornament and then colored it in and added some liquid pearl dots to the ornament that I then matted onto a die cut from the large ornament from the Heirlooms Ornament - both of these shaped dies are available at JustRite right now - and are special seasonal dies only! I love how fun it was to make this card - with a stamp set name like: Merry & Bright - it felt right to go the Merry and Bright road with paper - and so I added a bright strip behind the ornaments and then punched out the sentiment: "Enjoy the Moments that make the season bright" onto the center of the ornament. I added some liquid pearls around the center sentiment as well as to around the ornament. Accessories: crimper, dimensionals,Heirloom Ornament dies 2010, Heirloom Ornament dies 2011, liquid pearls, ribbon, pearl accessory, Swiss Dots embossing folder, and copics. JustRite June Release: Deck the Halls!